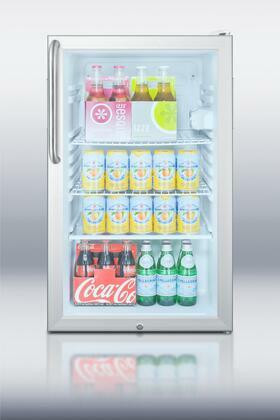 The SCR450LTBADA is an all-refrigerator with a 4.1 cu.ft. capacity. It has a white cabinet with a glass door and keyed lock. A hospital grade cord with a 'green dot' plug offers additional safety in high traffic areas. This unit includes a curved towel bar handle in brushed stainless steel. 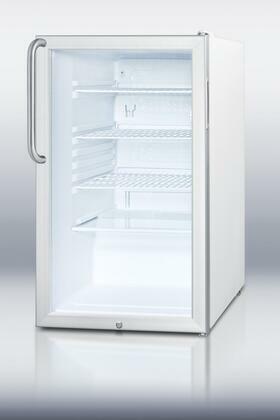 Inside, the SCR450LTBADA includes adjustable wire shelves for attractive and convenient storage. The interior light functions on an on/off rocker switch and an adjustable thermostat offers easy temperature control. At just under 20" wide, SUMMIT SCR450LTBADA is an easy-fitting ADA compliant beverage refrigerator fit for any setting. Versatility and durability as one would find in this Summit refrigerator is exactly what establishes brand loyalty. I had to repair my old fridge every few months towards the end of its life. Found a very reasonable deal on AppliancesConnection.com for a Summit refrigerator and jumped at the chance. Highly recommend this model. 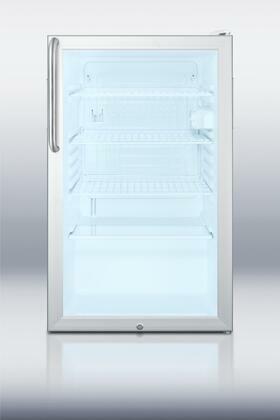 After two months with this refrigerator, I have to say I absolutely adore all of the clever features Summit included. The design looks amazing in my redone kitchen! As a competitive athlete, I eat a lot so I can train a lot! I needed a fridge with as much space as possible. I was very pleased with the cavernous storage of this Summit refrigerator. It has a fantastic capacity for the price point. Great product ! I feel relieved that I finally found a website that I can trust that provides good quality products with amazing customer service.